U.S. prosecutors have their own vampire squid problem. Federal law enforcers wrapped their tentacles around a former Goldman Sachs programmer for swiping computer code but lost in court. Now their New York counterparts are taking a shot. Such dual-action tactics evoke the kind of overreach that has foiled insider trading cases. It’s clear Sergey Aleynikov breached company policy by transferring high-frequency trading code outside the bank. Instead of merely suing him, though, Goldman called the FBI. An appeals court tossed his eventual conviction, ruling his actions weren’t federal crimes. New York’s district attorney is now pursuing Aleynikov under somewhat broader state laws. It was troubling enough that Manhattan U.S. Attorney Preet Bharara’s office attempted to stretch espionage and hacking laws to cover his behavior. It’s reminiscent of his team’s overly broad interpretation of rules against insider trading. A federal appeals court lambasted those views last December when it overturned the convictions of hedge fund managers Todd Newman and Anthony Chiasson. The tendency to overreach may be linked to an appetite for publicity. Bharara has courted attention by boasting in tweets, speeches and news conferences about taking Wall Street scalps. Sometimes he goes too far. On Friday, U.S. District Judge Valerie Caproni warned that “a media blitz orchestrated” by his office threatened the rights of Sheldon Silver, a New York politician charged with corruption. Bharara strayed “close to the edge of the rules governing his own conduct,” Caproni wrote in denying Silver’s motion to quash the indictment. New York District Attorney Cyrus Vance has also proven touchy about public opinion. In dropping a 2011 sexual assault investigation against former IMF boss Dominique Strauss-Kahn, for example, he issued a highly unusual document justifying his decision to a global audience. Many criminal cases are better handled as lawsuits. The lower standard of proof in civil litigation may still allow the Securities and Exchange Commission to penalize Chiasson, for example, despite dire warnings that the December ruling gutted insider trading law. Criminal charges grab headlines, though, even if they inflict serious damage on those wrongly accused. It was a 2010 Rolling Stone magazine article that famously gave Goldman its moniker as a deep-sea cephalopod feeding its appetite for money. Substitute “self-aggrandizement” in place of “money” and it’s a pretty fair description of prosecutors’ behavior as well. 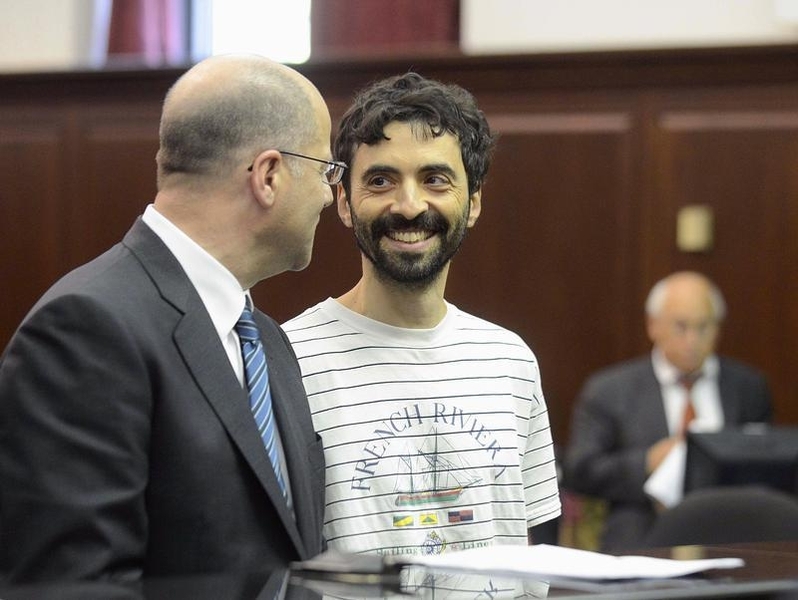 The trial of former Goldman Sachs programmer Sergey Aleynikov started on April 8 with testimony from Goldman technology employee Joseph Yanagisawa. The New York District Attorney’s Office has charged Aleynikov, a dual citizen of Russia and the United States, with stealing computer code as he prepared to leave the bank for a high-frequency trading firm in Chicago. His lawyers argue that the case should be barred by double jeopardy given that he was tried, convicted and then vindicated in a federal trial. They also say his behavior was not a crime. On April 10, U.S. District Judge Valerie Caproni refused to dismiss federal corruption charges against former New York State Assembly Speaker Sheldon Silver despite potentially prejudicial statements made by Manhattan U.S. Attorney Preet Bharara.